With summer here, who doesn’t love a good old game on the tennis court? From a knock about with your mates to a full-on grudge match with your tennis club nemesis,to really score the advantage you need to make sure you have the gear to match. Whatever your tennis level, grabbing any old pair of sneakers for a blast on the tennis court simply just won’t do. Unlike running or general sports shoeswhich are generally softer, for a fast-paced game like tennis you also need support and stability to help you play harder, faster and stronger. Simply put – you want to be able to do a victory leap over the net after busting your opponent’s serve than be left in chalk dust when your footwear lets you down. So, if you are looking to channel your inner Pete Sampras this season, then let us help you find the perfect love match when it comes to your next pair of tennis shoes. 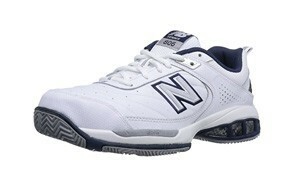 If you’re looking for an all-round tennis shoe at a decent price, then you can’t go wrong with New Balance’s mc806. Happiest on a hard court – with its herringbone sole and reinforced toe it makes light work of concrete – it also features a non-marking outsole and good traction, allowing this stylish tennis sneaker to step it up if you move over to clay. The mc806 also offers stability and support,helping to sustain your balance and pace, even in the most fast and furious of matches. If speed’s your thing, then ASICS Gel-Solution tennis shoe is your new best bud. Low profile and lightweight, this whippet of a shoe turbo-charges your game and gives you superior maneuverability to boot. Its outsole is hardwearing and can take the rough of a hard court while absorbing the twists, turns and sprints of an adrenalin-fueled game. If you’re looking for a mid-price, quality tennis sneaker with Road Runner ambitions, then this is the shoe for you. For a no-nonsense tennis shoe, check out Nike’s Court Lite. Durable, with enough comfort and stability to see you through the twists and turns of a good game, the hardwearing Court Lite also offers lasting traction on tougher surfaces. When it comes to looks, this isn’t the sharpest kid on the block, but it’s ultimately a fantastically straightforward tennis trainer that can step up to the baseline as your game develops. Great value all-rounder that does what ‘it says on the tin’. A firm favorite on the court, the BarricadeClub will give you the advantage when it comes to combining performance and value. Lightweight but with the cushioning and support you would expect from a more expensive tennis shoe, the Barricade is no budget store player. The more aggressive player will also appreciate the Barricade’s midfoot support system that makes light work of every twist and lunge to get you through the most intense of rallies. Super comfortable and light on its feet, the Hypercourt Express is one of the speediest tennis shoes on the circuit. With just the right amount of rigid support to keep your foot stable, the Hypercourt is built to cope with the rigors of both fast to the net sprints and intense lateral play. Some K-Swiss diehard fans may rally against the use of breathable fabric rather than the typical all-leather this Californian company is known for, but this lightweight tennis sneakerhas the balls to get your game flying high. Designed for regular tennis players with medium-intensity footwork, ASICS Gel Dedicate 5 are hardwearing enough to take you from starter player to game smasher. This tennis shoe is a real all-rounder and has been designed for both hard and soft surfaces without compromising on durability or performance. With its classic good looks, you’ll feel the part as you step up to serveand, with its impressive cushioning and traction, you’ll be ready to bring the game on.The Gel-Dedicate 5 also comes in at a great price point for new to the court or recreational players. With top-notch comfort and performance, along with uncomplicated looks, what’s not to love about the MC1006v1 tennis shoe? 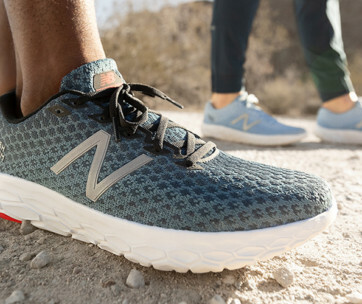 New Balance has placed stability, cushioning and breathability at the forefront of this shoe’s design, resulting in a classic all-surface tennis trainer that will keep you cool when the temperature on court rises. A great fit for those of us with feet on the wider side, its rigid outsole is also extremely hardwearing, but this does mean that it’s perhaps not as flexible as some other tennis shoes on the market. But if comfort and value for money are as important as performance, then the MC1006v1 is good bet. With good traction and grip, the Approach is more geared to a hard court, but is adaptable enough to switch it up on softer surfaces. Solid and unfussy, with the typical Adidas credentials, the Approach tennis shoe is an extremely sturdy sneaker that is just lacking a bit in the cutting edge looks department. But looks are not everything and its strength is in the power it can put in your foot when you step up the pace. A comfortable, hardworking tennis sneaker for everyday play. If you are an aggressive baseline player, then the ASICS Gel-Resolution 7 offers awesome stability, even in the fastest of games on a hard court. This tennis shoe can take whatever you throw at it, without sacrificing comfort or support. Rear and fore foot gel cushioning provide effective shock absorption while a tough outsole, outer panels and toe protector support a wide range of fast-paced as well as lateral movement. The Gel-Resolution 7’s sturdy design and cushioning systems mean that they can be a little snug at first, but this is a definitely a shoe to bear with and your game will thank you for it! If you are racking up the hours on the court and comfort is becoming your thing, then check out Babolat’s Propulse Blast and give your tennis-tired feet a treat. Best suited to clay court but with adurable enough outsole to mix it up, these little beauties cocoon your feet so that you can keep on playing. Lightweight upper with power straps mid-foot provide support during side to side movement while EVA cushioning and filled tubes in the heel offers effective shock absorption. A Michelin outsole gives fantastic traction and support. In short, this is a durable, good-looking tennis shoe that sets you up for your game time and time again. Get the advantage in the speed stakes with Wilson’s KAOS Composite tennis shoe. Designed with fast-paced, confident players in mind, this sleek-looking tennis shoe is able to combine durability and comfort while opening up the throttle for speed play. Lightweight and flexible, this tennis shoe can give you wings on the sprints yet provides enough traction and grip for intense play, pivots and lateral moves. It also seems to be almost indestructible, with tough toe protector and solid outsole ready to weather whatever rough play you can throw at it. A great, hardwearing sports shoe for players who like to go for the max. You get an awesome grip with this mid-price, well-fittingtennis shoe from Nike, keeping you secure if explosive sprints and directional changes are your go-to playing style. Totally at home on a hard court, the Vapor X brings the Nike touches you would expect to create an extremely light and fast tennis shoe that will appeal to the competitive player. Nike’s Dynamic Fit and Zoom Air technology makes the Vapor a top-settennis sneaker that puts your foot and your game in total control. A great value, elite sports shoe that is super responsive and totally ready to go. Stepping up from the Barricade Club, the Barricade 2018 tennis shoe has been designed to give professional player performance at an affordable price. Its Geofit construction offers comfort and cushioning where you need it the most and supports you as you up your game. The Barricade 2018 also has a flexible, man-made upper that stretches to adapt to your every move and can weather the hardest of serves, volleys and extreme speed moves. But its impressive flexibility does compromise stability. Its chassis construction provides a secure lock-down fit that also gives the right amount of cushioning and freedom of movement plus a tough outsole to absorbs the shocks of a hard game. All in all, a durable tennis shoe that can take every twist, lunge or sprint in its stride. Designed with the performance player in mind, these handsome tennis shoes have the comfort, cushion and support needed for some seriously switched on play. Streamlined and lightweight, the Propulse Fury also has just enough technical spec toshow that you mean business on court. Babolat’s clever power belt construction adds superior support around the forefoot, ankle and heel for the stability and agility you need to blast around your opponent while high-performing shock absorption and memory-shaped insole ensure a comfortable ride. These fast-paced tennis sneakers are also built to last, with Michelin performance outsole giving excellent traction and durability. So, get center-court ready with this ace all-court shoe that justifies its price tag. Not the most traditional looking tennis sneaker, with its high ankle support giving it a baseball boot-vibe but don’t let that put you off. This is a tennis shoe that has been designed to slide on a hard court, giving you the speed and stability to cover more ground. 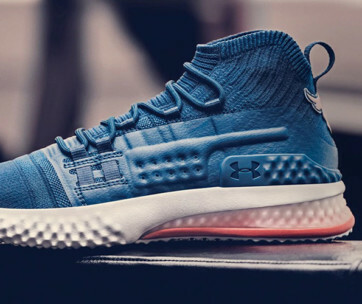 Aimed at competitive players, it supports you to power through each set, with its low-to-the-ground design keeping you connected to the court surface during a fast and furious game. Glide control technology gives support and stability in lateral movements and slides, boosting your recovery and speed as you cover the court. A total power house of a tennis shoe that’s worth the investment. From casual play or the occasional knock-about to a more serious player with a competitive edge, the type of tennis sneaker you choose needs to game, set and match your own tennis ambitions. 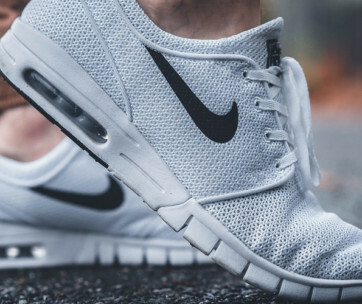 Size: just like all other sports shoes, tennis sneaker sizing is based on the length and width of your foot. A correctly-fitting shoe will give you the right support and prevent blistering and foot pain. If in any doubt of your size, get your feet measured at your sports store. Comfort –comfort is king in your tennis shoes…you don’t want to have to think about your footwear, you have a match to smash! As well as correct fit, look out for materials and design that provide enough breathability while giving you support and protection when the game is on. Design– don’t be tempted to go for an everyday sneaker if you want to ace your tennis game. Tennis shoes are specifically designed to cope with the demands of the court, meaning they are heavier, flatter and stiffer than everyday athletic shoes. So, as well as getting your head turned by a cooler than cool design, check out the features that will give you support, shock absorption, cushioning and reinforcement. Color–although tennis clothing is traditionally white – and the iconic white does look ace – there are enough color variants on the market to make the color of your tennis sneakers a personal choice. Insole –the pivots, sprints and lunges of a full-on tennis match will challenge your feet, so give them a helping hand with the right insole. Your insole will ensure constant contact with the base of the shoe, providing support when you flex and run. A well-fitting insole will also help to keep foot, knee and back problems at bay. Outsole– the sole of a tennis shoe provides direct contact with the ground, so look for an outsole and tread that matches your preferred court surface and provides sufficient traction and shock absorption to give your game the advantage. Cushioning–Tennis trainers are designed to deal with the frequent stops and starts of an energetic game and their low profile and rigid sole provide stability through a range of movements. Effective cushioning in the heel and forefoot brings extra comfort and helps to lessen impact. Durability -when it comes to putting your shoes through their paces, a game of tennis certainly takes no prisoners. Investing in a good pair of tennis sneakers means you’ll have footwear to see you beyond one season. Make sure your shoes are tough enough for your playing style and preferred court surfaces and have the right features to enhance their durability. When it comes to acing your game, it isn’t a case of one size fits all, you need to match your tennis shoes to how and where you play. Tennis can be played on a variety of surfaces, and the court type has a bearing on the tennis shoes you need. So, whether your preferred surface is hard court, soft clay or grass, you’ll need to choose the type of shoe to keep you match fit. For hard court surfaces, such as concrete, you’ll need a shoe with increased durability to ensure the shoe’s outer sole is resilient and that there’s sufficient cushioning and support in the shoe’s upper to keep your foot protected. Hard courts can also wear out your soles more quickly so keep an eye out for any wear and tear. The play on a soft or clay court is slower than a hard surface, so you need tennis trainers designed with lateral support and traction in mind as you power-play from the baseline. 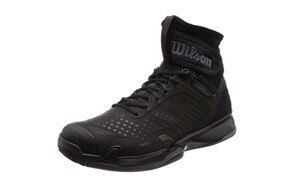 They also need a sole that grips without leaving marks on the court surface. For grass courts, you’ll need good grip as it can be slippery underfoot and a flatter outsole so you don’t damage the turf. You don’t need as much durability in your tennis shoe if you are playing on grass as the surface is softer underfoot. Do you play where the chance takes you? If you’re mixing it up on grass, concrete or clay, then opt for a multi-court shoe that’s been designed for play on different surfaces, saving you the cost of buying different types of tennis shoes for men. Are you an aggressive baseliner, prefer to serve and volley or are an all-court player? Whatever your playing style, you need to choose a pair of tennis shoes that can keep up. Playing from the baseline means you need durable soled-shoes to support you as you move from side-to-side and provide stability as you power the ball down the court. But for a serve and volley player, you’ll also need a durable toecap and well-fitting insole to protect your foot in the forward and back movement as you play. If in any doubt, chat to the fitting expert in your sports store, and you’ll soon get matched up with your tennis shoe ‘sole’ mate. Q: What is the importance of tennis shoes? 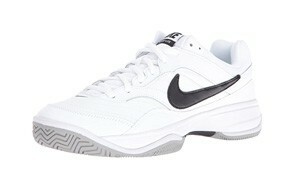 A: To be at the top of your game, it’s essential to wear shoes specially designed for the tennis court. Unlike athletic or general sports shoes which are designed for cushioning and forward movement, tennis shoes are specifically geared to deal with the rigors of a fast-paced match. As a tennis player you’ll be blasting through a wide range of lateral movements – forward, back, side to side - as well as short starts and stops and you need the right shoe to match them. Stability, durability and traction are the key to a good tennis shoe and the softer, more flexible sole of an athletic shoe just won’t cut it.